In what can only be perceived as a ‘dry’ sector, AXA sought a partner to communicate their extensive support of science research into life-areas of risk that most affects us all − health, the environment and the socio-economic − to a global, online audience. We help brands and organisations create film-led content marketing solutions, meeting a range of communications opportunities and challenges on their agendas. For AXA to make head-turning, pop-science content, we brought in YouTube science vlogger Greg Foot (a well-known science communicator) as presenter. 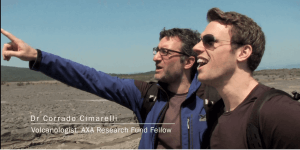 Greg’s investigative science journeys, meeting AXA-supported researchers to discover their progress on some big life-science questions, proved both engaging and contemporary. These five minute films + 60 sec & 15 sec trailers earnt AXA a well-earned stake in the online phenomena of pop-science video. With editorial strong enough to attract interested third party publishers (e.g. Wellcome Trust), at zero media cost to AXA. The campaign anchored on YouTube AXA RF live, delivering to date over 1.5 million views (more than 3 million across all channels) with exceptional YouTube dwell time of over 2.5 minutes. The TEN Difference: Science vlog solutions that engage via the power of meaningful stories. Are you are our next TEN member? Apply today.